Wattless Lighting auditing software is designed to help users save time, conduct accurate audits and secure more business. Using an iPad or iPhone, the Wattless lighting auditing software prompts the user to complete each parameter of the lighting audit, ensuring a thorough survey is carried out and eliminating costly site re-visits. The new luminaires, controls, accessories, access requirements, labour costs, incentives and grants available are captured in the pricing. 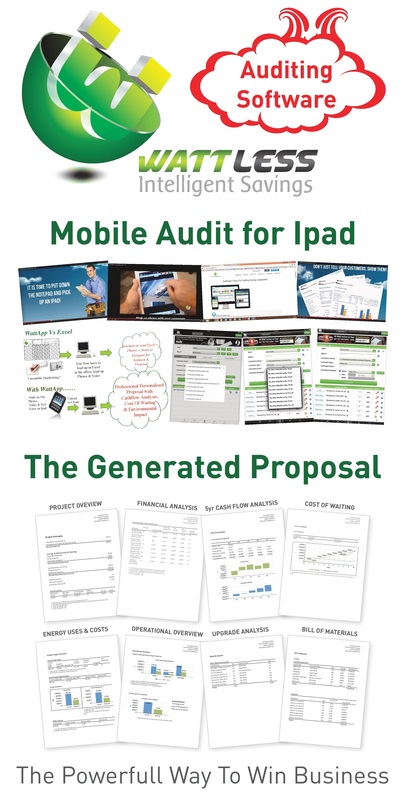 The lighting auditing software then produces a comprehensive report including CapEx. Environmental Impact, Cash Flow analysis, Net Present Value of the savings and Cost of Waiting. See pictures above for examples.